(C) 2011 Sergei I. Golovatch. This is an open access article distributed under the terms of the Creative Commons Attribution License, which permits unrestricted use, distribution, and reproduction in any medium, provided the original author and source are credited. The genus Eustrongylosoma is currently represented in New Guinea by 23 species, including nine new from the Telefomin area, Finim Tel Plateau and Mount Fugilil, western Papua New Guinea: Eustrongylosoma curtipes sp. n., Eustrongylosoma liklik sp. n., Eustrongylosoma maculatum sp. n., Eustrongylosoma masalai sp. n., Eustrongylosoma mirabile sp. n., Eustrongylosoma pallidum sp. n., Eustrongylosoma papua sp. n., Eustrongylosoma tifalmin sp. n. and Eustrongylosoma tumbuna sp. 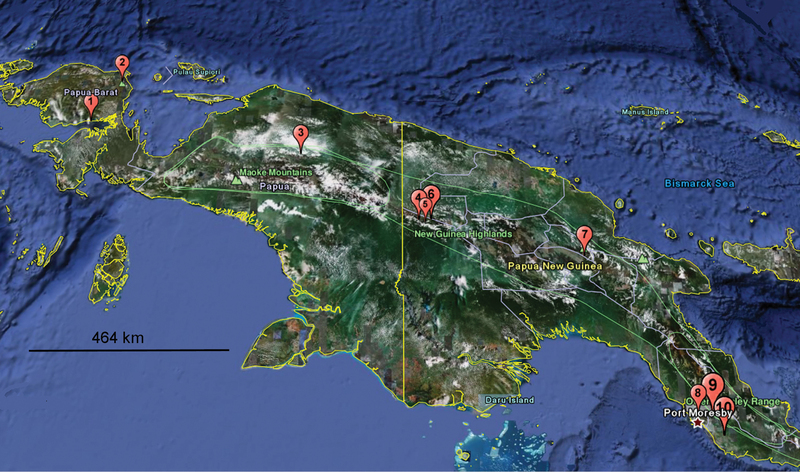 n. The genus has been rediagnosed, all of its known New Guinea species have been keyed, and their distributions mapped. The genus Eustrongylosoma Silvestri, 1896is currently amongst the largest in the paradoxosomatid fauna of the Papuan region, comprising 20 described and several undescribed species ranging from Borneo and the Philippines in the west, to Micronesia in the north, and to Melanesia and New Guinea in the east (Hoffman 1977/1978; Golovatch 1997). The island of New Guinea alone has hitherto been known to support 14 species (Silvestri 1895, 1898; Attems 1932; Chamberlin 1945; Jeekel 1967; Hoffman 1977/1978; Golovatch and Stoev 2009, 2010), most of which have been keyed (Jeekel 1967; Hoffman 1977/1978). One species has long been described from Sulawesi and Borneo, Indonesia (Attems 1897), revised rather recently from type material (Golovatch 1997). The remaining five species have been named from the Solomon Islands (Chamberlin 1920), all subsequently revised and keyed, based on type material as well (Jeekel 1973). 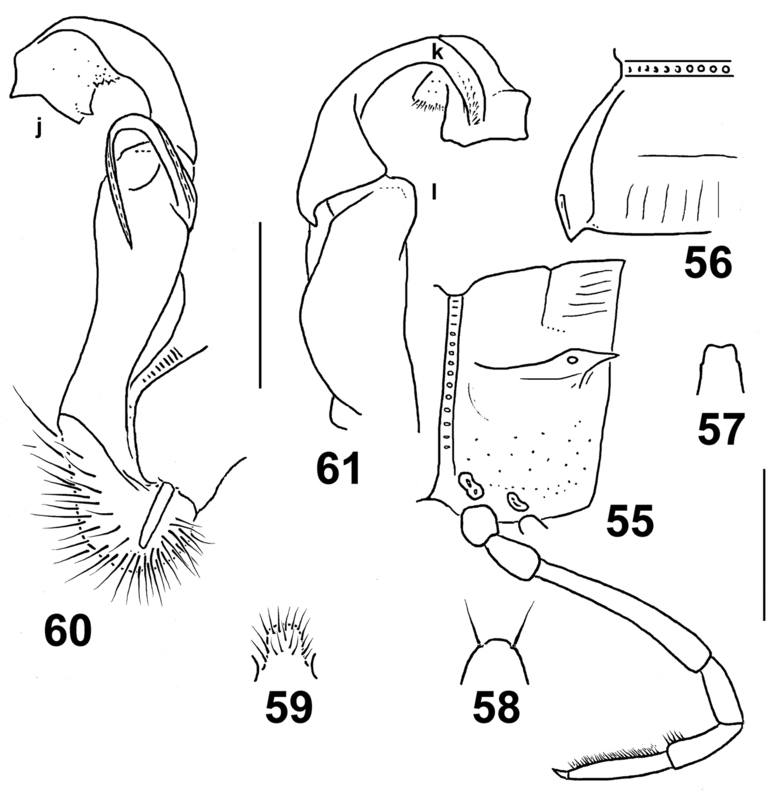 The present contribution focuses on descriptions of further nine new species of Eustrongylosoma taken in 1975 in Papua New Guinea by the British Speleological Expedition (B.S.E. ), mainly by Petar Beron. This material is housed in the National Museum of Natural History, Sofia, Bulgaria (NMNHS), with only three species of that genus having been described previously from that collection (Hoffman 1977/1978; Golovatch and Stoev 2009, 2010): Eustrongylosoma beroni, Eustrongylosoma exiguum and Eustrongylosoma finimtel. The opportunity is taken here not only to describe further Papuan congeners present in the NMNHS collection, but also to provide a new, up-to-date key to all Eustrongylosoma species currently known from the entire island of New Guinea. Their distributions have been mapped as well (Fig. 62). A dynamic web page for each taxon name mentioned in the paper is generated on the fly by the Pensoft Taxon Profile tool (see Penev et al. 2010). All species descriptions are automatically exported to a wiki platform (www.species-id.net) through the Pensoft Wiki Convertor (Penev et al. 2011; Stoev and Enghoff 2011). The bulk of the material treated here has been returned to NMNHS, only a single paratype having been donated to the collection of the Zoological Museum, State University of Moscow, Moscow, Russia (ZMUM). Small to medium-sized (12–33 mm long) Eustrongylosomatini with 20 segments and a normal ozopore formula. Paraterga medium-sized to missing, never as high as dorsum. Tergal setae usually few, mostly abraded and traceable only as insertion points, metaterga only rarely abundantly setose. ♂ legs without adenostyles, but usually with tarsal (sometimes also distotibial) brushes. A sternal lobe or two cones between ♂ coxae 4. Gonopod subcylindrical, setose distodorsally, rather long, but considerably shorter than telopodite; prefemoral (= densely setose) part at least twice shorter than femorite; the latter without evidence of torsion (= seminal groove running entirely mesally), but with an evident dorsomesal groove (only rarely transformed apically into a small projection) delimited by longitudinal folds or crests; distal part of femorite projected into a distinct lateral lobe or process (l) and extended considerably beyond beginning of a long and flagelliform solenomere; solenophore about as long as to only slightly shorter than femorite, coiled, directed laterad, with lamina lateralis produced basad before subtending solenomere and evidently more strongly developed than lamina medialis, both laminae being elaborate. Strongylosoma fasciatum Silvestri, 1895, by original designation by Silvestri (1896). Above is a slightly amended diagnosis of Eustrongylosoma which seems to be especially topical because a number of Eustrongylosomatini species from New Guinea have recently been revised and/or reallocated, and a new genus proposed (Jeekel 2009). 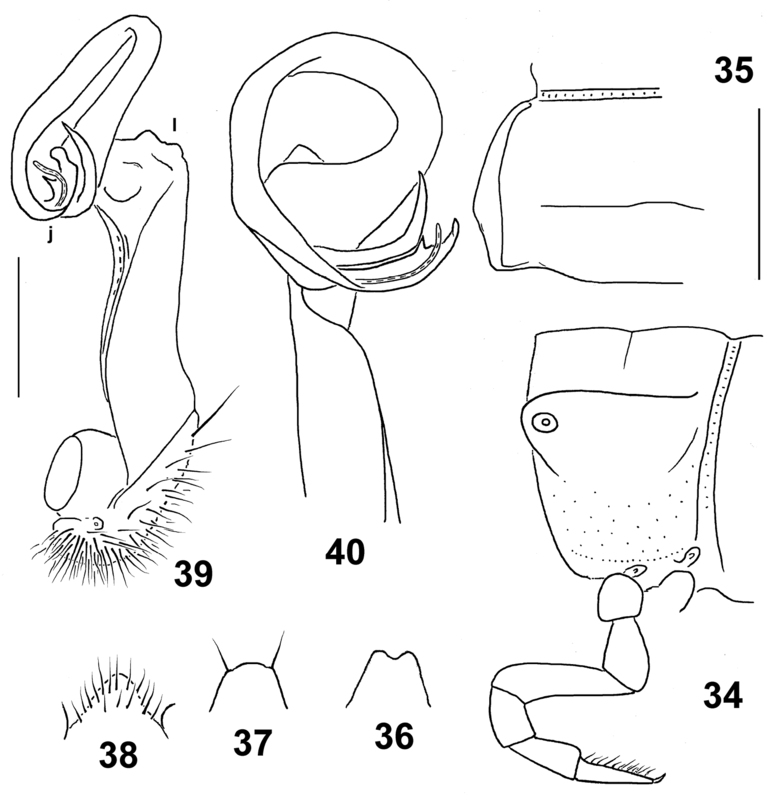 In addition to Eustrongylosoma, this tribe currently comprises the following five genera from New Guinea: Nothrosoma Attems, 1929 (three species), Perittotresis Attems, 1914, Astromontosoma Hoffman, 1978, Selminosoma Hoffman, 1978 (all three monobasic), Silvattia Jeekel, 2009 (two species), as well as one more from the Seychelles: Diglossosternoides Golovatch & Korsós, 1992 (monobasic) (Hoffman 1977/1978; Golovatch and Korsós 1992; Jeekel 2009). Most of them have long been keyed (Hoffman 1977/1978). Basically, Eustrongylosoma is distinguished from all of them by the presence of a distinct distolateral lobe or process on a medially excavate gonopod femorite, combined with the absence of any evident outgrowths just before the beginning of a long solenomere. Holotype♂(NMNHS), Papua New Guinea, Western Province, Finim Tel Plateau, near Cave Kumsop Tem, 16 August 1975, B.S.E. (leg. Ph. Chapman & P. Beron). – Paratypes: 1 ♀(NMNHS), same locality, together with holotype. 2 ♂ (fragmented, one with only head and segments 1–8, the other lacking segments 8–12) (NMNHS), 1 ♂ (ZMUM), West Sepik Province, Telefomin area, 1700 m, September 1975, B.S.E. (leg. P. Beron). Emphasizes the abundant setae on the collum and following metaterga, to reflect “papua” which means “curly-headed” in Tok Pisin (= Pidgin English, Neomelanesian). A noun in apposition. Due toabundanttergal setae, comes closest tothe partly sympatricEustrongylosoma beroni Golovatch & Stoev, 2009, but differs in the semi-circular hypoproct, the more elaborate solenophore tip and the stouter sternal lobe between ♂ coxae 4 (see also Key below). Length of both holo- and complete paratypes ca 20–21 mm, width of pro- and metazona 1.4–1.6 and 1.7–1.9 mm (♂), or 1.9 and 2.2 mm (♀), respectively. Holotype ca 20 mm long, 1.6 and 1.9 mm wide on midbody pro- and metazona, respectively. Coloration rather uniformly light brown to brown, sometimes with a faint cingulated pattern due to slightly infuscate prozona and more flavous metazona; paraterga, epiproct, venter and legs light yellow-brownish. In width, head > segment 2 = 5–16 > collum > 3 = 4; on segments 17–19, body gently tapering towards telson. Entire head densely setose. Antennae rather long, slightly clavate, reaching beyond segment 4 (♂) or 3 (♀) dorsally; antennomere 2 longer than 6th. Collum transversely oval, lateral flaps small, regularly and broadly rounded. Tegument generally rather smooth and shining, only below several anterior paraterga faintly microgranulate. Paraterga of postcollum segments rather poorly developed (Figs 1, 2), set low (at about 1/2–1/3 midbody height), subhorizontal to faintly declivous, thin, blade-shaped, only a little thicker in pore-bearing segments; each callus with 3–5 small, but evident denticulations at lateral margin. Only paraterga 2 with caudal corner slightly obtusangular, narrowly rounded; following paraterga acutangular and pointed, yet evidently extending beyond rear tergal margin only on segment 18. Lateral callus of paraterga narrow, delimited by a complete sulcus only dorsally, in pore-bearing segments in caudal 1/3 also ventrally. Collum and following metaterga abundantly and irregularly setose (Figs 1, 2), setae being medium-sized, not borne on knobs. Ozopores lateral, superficial, ovoid, lying in front of penultimate denticulation. Axial line nearly wanting, vaguely traceable only here and there on metaterga. Transverse sulcus on metaterga especially superficial and incomplete on metatergum 4, slightly deeper, but still somewhat not reaching bases of paraterga in metaterga 5–17. Stricture between pro- and metazona evidently beaded. Pleurosternal carinae small, complete only in segments 2–4, divided into a front swelling and a sharp caudal denticle in segments 5–7(8), thereafter entirely missing. Epiproct short, flattened dorsoventrally, digitiform; apical papillae rather evident, dentiform, directed caudad; subapical papillae small, strongly removed from tip. Hypoproct semi-circular, setigerous paramedian knobs at caudal margin well-separated and small. Sterna rather densely setose; a rather high, linguiform, subtruncate, ventral, setose lamina only between ♂ coxae 4 (Fig. 3). Legs relatively long, midbody ones ca 1.5–1.7 (♂) or 1.2–1.3 times (♀) longer than body height, a little slenderer in ♀; ♂tarsal brushes increasingly reduced towards legs of segment 12. Gonopods as in Figs 4–6. Solenomere as usual, flagelliform, nearly entirely sheathed by well-developed lamina lateralis and lamina medialis. Distal 1/3 of solenophore with a lateral denticle (k), as well as a subapical and an apical lobule on a larger branch (j). Femorite with a large, rounded, apicolateral lobe (l). Eustrongylosoma papua sp. n., ♂ paratype from Telefomin area. 1 segment 9, lateral view 2 left half of segment 9, dorsal view 3 sternal lobe between coxae 4, caudal view 4–6 right gonopod, mesal, dorsal and lateral views, respectively. Scale bars: 1.0 (1–3) and 0.3 mm (4–6). Holotype♂(NMNHS), Papua New Guinea, Western Province, Mt Fugilil, near camp, 2980 m, 9 September 1975, B.S.E. (leg. Ph. Chapman & P. Beron). – Paratype: 1 ♂(NMNHS), West Sepik Province, Telefomin area, 1700 m, September 1975, B.S.E. (leg. P. Beron). “tumbuna” means “ancestor” or “ancestors” in Pidgin English. A noun in apposition. Differs from congeners by the rather wide paratergal calluses strongly delimited not only dorsally, but also ventrally, by the distal part of the solenophore being dentate/lobulate, not split (see also Key below). Length of both holo- and paratype ca 20 mm, width of pro- and metazona 1.4 and 2.1 (holotype) or 1.2 and 1.8 mm (paratype), respectively. Coloration rather uniformly light brown to brown, only front 1/3 of body slightly more intensely brown; dorsal sides of prozona, calluses on paraterga, epiproct and venter light yellow-brown to nearly pallid. Sometimes (paratype) region near stricture between pro- and metazona slightly infuscate, brown, thus creating a faint cingulate pattern. In width, head >> collum = segment 3 = 4 < 2 < 5–16; thereafter body gently tapering towards telson. Entire head densely setose. Antennae rather long, slightly clavate, reaching beyond midlength of segment 3 or 4 dorsally; antennomere 6 longer than 2nd. Collum transversely oval, lateral flaps small, regularly and broadly rounded. Tegument generally smooth and shining, only below paraterga faintly microgranulate; rear halves of metaterga sometimes faintly rugulose. Paraterga of postcollum segments moderately well developed (Figs 7, 8), set low (at about 1/3 midbody height), subhorizontal, evidently thicker in pore-bearing segments than in poreless ones; paratergum 2 with a small anterolateral denticle, its front margin straight; following paraterga without denticulations at lateral margin, sometimes with only a very faint undulation near midway. Caudal corner of all postcollum paraterga pointed to narrowly rounded, starting from 5th extending beyond rear tergal margin. Lateral calluses of paraterga rather wide, especially so on pore-bearing segments, each delimited by a sulcus both dorsally and ventrally. Ozopores lateral to dorsolateral, placed inside an ovoid groove. Tergal setae mostly abraded, retained ones about 1/5 the length of metaterga, pattern traceable at least as 1+1 paramedian insertion points in front row (Figs 7, 8). Axial line nearly wanting, vaguely traceable only here and there on metaterga. Transverse sulcus on metaterga rather superficial, nearly reaching bases of paraterga in metaterga 5–18. Stricture between pro- and metazona rather faintly striolate. Pleurosternal carinae small, complete or nearly so in segments 2–8, a sharp or rounded caudal denticle retained also in segments 9 and 10, thereafter entirely missing. Epiproct (Fig. 9) short, flattened dorsoventrally, digitiform; apical papillae small, tip faintly concave; subapical papillae evident, removed from tip. Hypoproct subtrapeziform, setigerous paramedian knobs at caudal margin well-separated and small. Sterna rather densely setose; a rather high, linguiform, caudally rounded, ventral, setose lamina only between ♂ coxae 4 (Fig. 10). Legs relatively long, midbody ones ca 1.6–1.7 times longer than body height, apparently slightly incrassate and longer compared to ♀; ♂evident tarsal and distotibial brushes increasingly well reduced towards legs of segment 10. 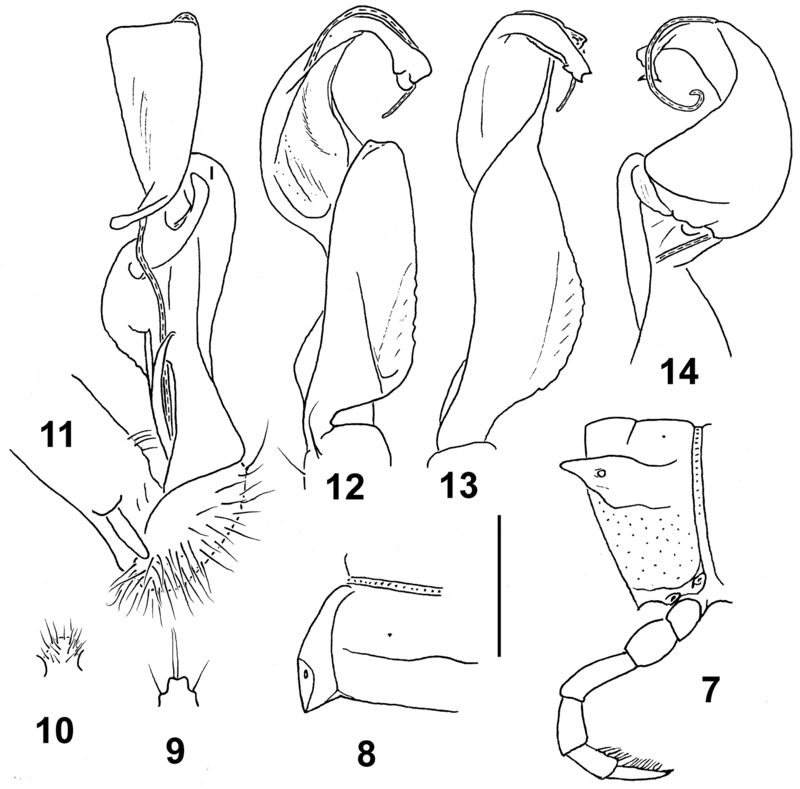 Gonopods as in Figs 11–14. Tip of solenophore simple, faintly trifid, with three apical denticles or lobules. Femorite with a large rounded lobe (l) somewhat hollow on mesal side. Eustrongylosoma tumbuna sp. n., holotype. 7 segment 10, lateral view 8 left half of segment 10, dorsal view 9 tip of epiproct, dorsal view 10 sternal lobe between coxae 4, caudal view 11–14 left gonopod, mesal, ventral, sublateral and subdorsal views, respectively. Scale bars: 1.0 (7–10) and 0.3 mm (11–14). Holotype♂(NMNHS), Papua New Guinea, West Sepik Province, Telefomin area, September 1975, leg. B.S.E. To reflect the wide spots/bands in the front halves of the collum, following metaterga and epiproct. Distinguished by the very poorly developed paraterga, coupled with a non-fringed tip of the solenophore (see also Key below). Length ca 24 mm, width of pro- and metazona 2.0 and 2.4 mm, respectively. Coloration light yellow-brown with front halves of collum, following metaterga and epiproct, as well as entire head and antennae contrasting brown, thus creating a clear cingulate pattern. In width, head > collum = segment 3 = 4 < 2 < 5–16; thereafter body gently tapering towards telson. Head densely setose, only vertex bare. Antennae rather short, clavate, reaching beyond segment 2 dorsally; antennomere 6 longer than 2nd. Collum transversely oval, lateral flaps small, regularly and broadly rounded. Tegument generally smooth and shining. Paraterga of postcollum segments very poorly developed (Fig. 15), set low (at about 1/2–1/3 midbody height); paratergum 2 a low ridge with a few wrinkles above; paraterga 3 and 4 virtually missing, traceable only as 3–4 similar wrinkles; following paraterga retained only as a dorsal sulcus/line (Fig. 15), barely visible in segment 19. Ozopores lateral, superficial. Tergal setae mostly abraded, retained ones about 1/4 the length of metaterga; setation pattern vague, sometimes traceable as 1+1 paramedian insertion points in front row. Axial line wanting. Transverse sulcus on metaterga highly superficial, incomplete, far from reaching bases of paraterga, visible only in metaterga 9–17. Stricture between pro- and metazona rather distinctly beaded. Pleurosternal carinae very small, complete crests or nearly so only in segments 2–4. Epiproct (Fig. 16) short, flattened dorsoventrally, digitiform; apical papillae very large, spiniform, directed more caudally than ventrally; subapical papillae missing. Hypoproct subtriangular, apex rounded, setigerous paramedian knobs at caudal margin small and rather faintly separated. Sterna densely setose; a rather high, linguiform, caudally rounded, ventral, setose lamina only between ♂ coxae 4 (Fig. 17). Legs relatively long, midbody ones ca 1.5–1.6 times longer than body height, apparently slightly incrassate and longer compared to ♀; ♂evident tarsal brushes increasingly well reduced towards legs of segment 10. Gonopods as in Figs 18 & 19. Distal part of solenophore split into a distinct frontomesal tooth (k) and a longer, somewhat curved lateral branch (j) with two subapical denticles and a lobule. Femorite with a large, rounded, apicolateral lobe (l). Eustrongylosoma maculatum sp. n., holotype. 15 segment 10, lateral view 16 tip of epiproct, dorsal view 17 sternal lobe between coxae 4, caudal view 18, 19 left gonopod, mesal and lateral views, respectively. Scale bars: 1.0 (15–17) and 0.5 mm (18 & 19). Holotype♂(incomplete, lacking segments 8–11)(NMNHS), Papua New Guinea, Western Province, Finim Tel Plateau, rain forest, 2300 m, 8 August 1975, B.S.E. (leg. P. Beron). To reflect the short legs. Distinguished by the rather short legs, coupled with quite evident paraterga and a missing colour pattern (see also Key below). Length ca 18 mm, width of pro- and metazona 1.1 and 1.3 mm, respectively. Coloration rather uniformly light brown to red-brown, only legs yellowish. In width, head > collum = segment 2 < 3 = 4 < 5–17; thereafter body gently tapering towards telson. Head densely setose, but vertex with 1+1 setae. Antennae short, clavate, reaching beyond segment 2 dorsally; antennomere 6 longer than 2nd. Collum transversely oval, lateral flaps small, regularly and broadly rounded. Tegument generally smooth and shining, only below paraterga faintly microgranulate. Paraterga of postcollum segments nearly missing (Figs 20, 21), set low (at about 1/2 midbody height), represented by low keels only in segments 2–4, thereafter only by evident lateral swellings. Ozopores lateral, superficial. Tergal setae entirely abraded, setation pattern untraceable. Axial line wanting. Transverse sulcus on metaterga superficial, far from reaching bases of paraterga, visible on metaterga 5–17. Stricture between pro- and metazona rather faintly striolate. Pleurosternal carinae small, complete in segments 2–5, only a sharp or rounded caudal denticle until segment 7, thereafter entirely missing. Epiproct (Fig. 22) short, flattened dorsoventrally, digitiform; apical papillae small, tip faintly concave; subapical papillae small, removed from tip. Hypoproct semi-circular, setigerous paramedian knobs at caudal margin well-separated and small. Sterna rather sparsely setose; a rather high, linguiform, caudally rounded, ventral, setose lamina only between coxae 4 (Fig. 23). Legs relatively short, midbody ones ca 1.1–1.2 times longer than body height, apparently slightly incrassate and longer compared to ♀; ♂evident tarsal and distotibial brushes increasingly well reduced towards legs of segment 19 and 16, respectively. Gonopods as in Figs 24–26. Base of solenophore and entire apicolateral lobe of femorite (l) evidently plicate. Tip of solenophore (j) rather deeply bifid, with a mesally fringed subapical margin. Eustrongylosoma curtipes sp. n., holotype. 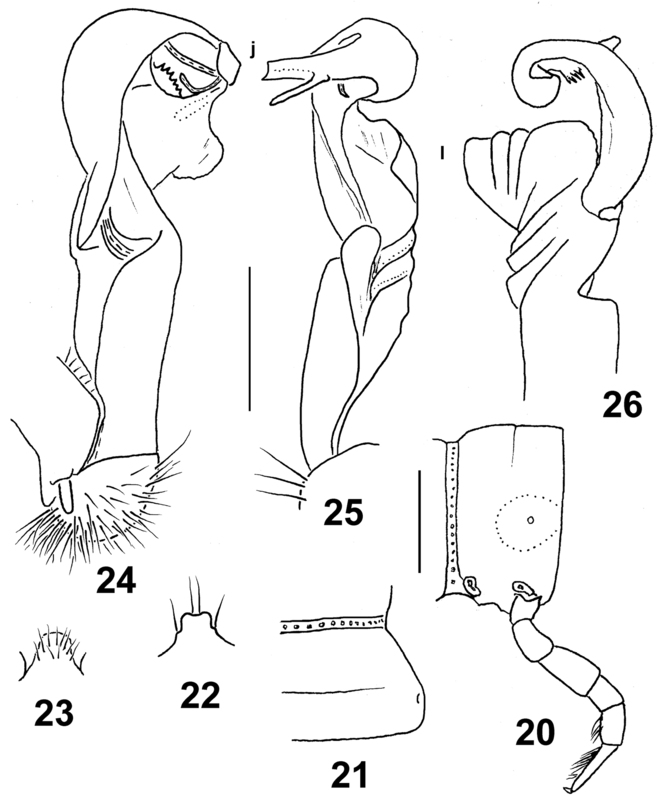 20 segment 10, lateral view 21 right half of segment 10, dorsal view 22 tip of epiproct, dorsal view 23 sternal lobe between coxae 4, caudal view 24–26 left gonopod, mesal, sublateral and subdorsal views, respectively. Scale bars: 0.5 (20–23) and 0.3 mm (24–26). Holotype♂(NMNHS), Papua New Guinea, Western Province, Finim Tel area, October 1975, B.S.E. (leg. P. Beron). – Paratypes: 2 ♀(NMNHS), same locality, together with holotype. “masalai” means a “brownie” in Pidgin English. A noun in apposition. Distinguished by the rather narrow paratergal calluses, coupled with a missing colour pattern and a deeply split distal part of the solenophore (see also Key below). Length ca 18 (holotype) or 20 mm (paratypes), width of pro- and metazona 1.3 and 1.8 (holotype) or 1.7 and 2.0 mm (paratypes), respectively. Coloration uniformly castaneous brown to light brown; antennae light yellow-brown, legs yellow. In width, head > collum = segments 5–17 < 2 < 3 = 4. Head densely setose, only vertex with 1+1 setae. Antennae rather short, slightly clavate, reaching beyond (♂) or end of segment 2 (♀) dorsally; antennomere 6 longer than 2nd. Collum transversely oval, lateral flaps small, regularly and broadly rounded. Tegument generally smooth and shining, only below paraterga faintly microgranulate; rear halves of metaterga sometimes faintly rugulose. Paraterga of postcollum segments moderately well developed (Figs 27, 28), set low (at about 1/3 midbody height), subhorizontal, evidently thicker in pore-bearing segments than in poreless ones; paratergum 2 with a small anterolateral denticle, its front margin straight; following paraterga without denticulations at lateral margin. Caudal corner of all postcollum paraterga rounded, slightly extended beyond rear tergal margin only in segments 2 and 17–19, better so in 18th. Lateral calluses of paraterga narrow, a little broader in pore-bearing segments, each delimited by a sulcus both dorsally and, in caudal 1/3, ventrally. Ozopores lateral, lying inside an ovoid groove. Tergal setae fully abraded, setation pattern untraceable. Axial line wanting. Transverse sulcus on metaterga rather superficial, far from reaching bases of paraterga, visible on metaterga 5–17, barely traceable also on 18th. Stricture between pro- and metazona rather faintly striolate. Pleurosternal carinae small, complete or nearly so in segments 2–5, a sharp or rounded caudal denticle retained also in segments 6 and 7, thereafter entirely missing. Epiproct (Fig. 29) short, flattened dorsoventrally, digitiform; apical papillae rather large, tip narrowly emarginate; subapical papillae missing. Hypoproct (Fig. 30) subtrapeziform, setigerous paramedian knobs at caudal margin well-separated and very small. Sterna rather sparsely setose; a rather high, linguiform, caudally rounded, ventral, setose lamina only between ♂ coxae 4 (Fig. 31). Legs rather long and slender, midbody ones ca 1.5–1.6 (♂) or 1.1–1.2 (♀)times longer than body height, in ♂slightly incrassate compared to ♀; ♂tarsal brushes increasingly well reduced towards legs of segment 14. Gonopods as in Figs 32 & 33. Tip (j) of a slender and coiled solenophore rather deeply biramous, larger branch bearing four apical or subapical denticles. Apicolateral lobe (l) of femorite relatively small. Eustrongylosoma masalai sp. n., holotype. 27 segment 10, lateral view 28 left half of segment 10, dorsal view 29 tip of epiproct, dorsal view 30 hypoproct, ventral view 31 sternal lobe between coxae 4, caudal view 32, 33 right gonopod, mesal and subventral views, respectively. Scale bars: 1.0 (27–31) and 0.3 mm (32 & 33). Holotype♂(NMNHS), Papua New Guinea, Western Province, Finim Tel area, October 1975, B.S.E. (leg. P. Beron). “Tifalmin” is the name of one of the main local tribes. A noun in apposition. Distinguished by the relatively large size, coupled with a peculiar, albeit vague, colour pattern and a deeply split distal part of the solenophore (see also Key below). Length ca 24 mm, width of pro- and metazona 1.9 and 2.6 mm, respectively. Coloration rather uniformly castaneous brown with a broad, rather vague, light yellow-brown, axial stripe running from collum to end of epiproct; much of prozona dorsally and dorsolaterally slightly infuscate, up to dark brown; head and antennae light brown; legs mostly light yellow-brown, only tibiae and tarsi infuscate, dark brown. In width, head = segments 5–17 > 2 > collum > 3 = 4. Head densely setose, only vertex bare. Antennae medium-sized, slightly clavate, reaching beyond segment 3 dorsally; antennomere 2 longer than 6th. Collum transversely oval, lateral flaps small, regularly and broadly rounded. Tegument generally smooth and shining, only below paraterga faintly microgranulate; rear halves of metaterga sometimes faintly rugulose. Paraterga of postcollum segments moderately well developed (Figs 34, 35), set low (at about 1/2–1/3 midbody height), subhorizontal, evidently thicker in pore-bearing segments than in poreless ones; paratergum 2 with a small anterolateral denticle, its front margin straight, its caudal corner slightly obtusangular, rather narrowly rounded, not extended beyond rear tergal margin; following paraterga without denticulations at lateral margin, sometimes with only a faint undulation in front of ozopore near caudal third. Caudal corners of postcollum paraterga always rounded, at most only slightly extended beyond rear tergal margin, more evidently so only in segments 16–19. Lateral calluses of paraterga medium-sized, broader in pore-bearing segments, each delimited by a sulcus both dorsally and, in caudal 1/3, ventrally. Ozopores lateral, lying inside an ovoid groove. Tergal setae mostly abraded, a few retained only on collum, about 1/5 the length of metaterga, setation pattern sometimes traceable at least as 1+1 paramedian insertion points in front row. Axial line wanting. Transverse sulcus on metaterga rather superficial, nearly reaching bases of paraterga in metaterga 5–18. Stricture between pro- and metazona rather faintly striolate. Pleurosternal carinae small, complete in segments 2–4, a sharp or rounded caudal denticle retained also in segments 5–8, thereafter entirely missing. Epiproct (Fig. 36) short, flattened dorsoventrally, digitiform; apical papillae large, tip narrowly emarginate; subapical papillae missing. Hypoproct (Fig. 37) roundly subtrapeziform, setigerous paramedian knobs at caudal margin well-separated and small. Sterna rather sparsely setose; a rather high, linguiform, roundly subtriangular, ventral, setose lamina only between coxae 4 (Fig. 38). Legs relatively long, midbody ones ca 1.6–1.7 times longer than body height, apparently slightly incrassate and longer compared to ♀; ♂evident tarsal and distotibial brushes increasingly well reduced towards legs of segment 19 and 9, respectively. Gonopods as in Figs 39 & 40. Tip (j) of solenophore very deeply biramous, larger (= outer) branch being faintly bidentate, smaller (= inner) one spiniform. Apicolateral lobe (l) of femorite rather small. Eustrongylosoma tifalmin sp. n., holotype. 34 segment 10, lateral view 35 left half of segment 10, dorsal view 36 tip of epiproct, dorsal view 37 hypoproct, ventral view 38 sternal lobe between coxae 4, caudal view 39, 40 left gonopod, mesal and subdorsal views, respectively. Scale bars: 1.0 (34–38) and 0.3 mm (39 & 40). Holotype♂(NMNHS), Papua New Guinea, West Sepik Province, Telefomin, 1700 m, 19 October 1975, B.S.E. (leg. P. Beron). “liklik” means “small” or “little” in Pidgin English. A noun in apposition. Distinguished by the small size, coupled with the short legs, the poorly developed paraterga and the contrasting infuscate distal antenno- and podomeres (see also Key below). Length ca 15 mm, width of pro- and metazona 1.2 and 1.4 mm, respectively. Coloration uniformly light yellowish, with distal antennomeres, as well as tibiae and, especially, tarsi contrasting dark brown. In width, head < collum = segments 3 = 4 < 2 < 5–16. Head densely setose, only vertex bare. Antennae rather short, slightly clavate, reaching beyond segment 2 dorsally; antennomere 6 longer than 2nd. Collum transversely oval, lateral flaps small, regularly and broadly rounded. Tegument generally smooth and shining, only below paraterga faintly microgranulate; rear halves of metaterga sometimes faintly rugulose. Paraterga of postcollum segments poorly developed (Figs 41, 42), especially weak in poreless segments, set low (at about 1/2 midbody height), sometimes with only a faint undulation in front of ozopore near caudal third, slightly more evident in segments 2 and 3, but even paraterga 2 and 3 with both anterolateral and caudal corners rounded. Caudal corners of postcollum paraterga never extended beyond rear tergal margin. Lateral calluses of paraterga always narrow, delimited by a sulcus dorsally, in most of pore-bearing segments ventrally in caudal 1/4 as well. Ozopores lateral, superficial. Tergal setae fully abraded, setation pattern vague. Axial line wanting. Transverse sulcus on metaterga rather superficial, incomplete, far from reaching bases of paraterga, visible on metaterga 5–17, barely traceable on 18th. Stricture between pro- and metazona rather faintly striolate. Pleurosternal carinae small, complete in segments 2–4, a caudal denticle retained also in segments 5–7, thereafter entirely missing. Epiproct (Fig. 43) short, flattened dorsoventrally, digitiform; apical papillae small, tip narrowly subtruncate; subapical papillae very small, well removed from tip. Hypoproct (Fig. 44) subtrapeziform, setigerous paramedian knobs at caudal margin well-separated and very small. Sterna rather sparsely setose; a rather high, linguiform, roundly subtriangular, ventral, setose lamina only between coxae 4 (Fig. 45). Legs short, midbody ones ca 1.0–1.1 times longer than body height, apparently somewhat incrassate and longer compared to ♀; ♂evident tarsal brushes increasingly well reduced towards legs of segment 19. Gonopods as in Figs 46 & 47. Distal half of solenophore split into a lateral lobe (k) and a narrowly bifid larger branch (j). Femorite with a large, rounded, apicolateral lobe (l). Eustrongylosoma liklik sp. n., holotype. 41 segment 10, lateral view 42 right half of segment 10, dorsal view 43 tip of epiproct, dorsal view 44 hypoproct, ventral view 45 sternal lobe between coxae 4, caudal view 46, 47 right gonopod, submesal and sublateral views, respectively. Scale bars: 1.0 (41–45) and 0.25 mm (46, 47). To reflect the pallid coloration. Distinguished by the pallid coloration, coupled with very poorly developed paraterga and the barbed solenophore tip (see also Key below). Length ca 20 mm, width of pro- and metazona 1.8 and 1.95 mm, respectively. Coloration uniformly light white-yellowish, with traces of light brown on rear halves of metaterga. In width, head > collum > segment 3 = 4 < 2 < 5–16. Head densely setose, only vertex with 1+1 setae. Antennae rather short, slightly clavate, reaching beyond segment 2 dorsally; antennomere 6 longer than 2nd. Collum transversely oval, lateral flaps small, regularly and broadly rounded. Tegument generally smooth and shining, only below paraterga faintly microgranulate and rugulose; rear halves of metaterga sometimes faintly rugulose as well. Paraterga of postcollum segments very poorly developed (Fig. 48), full ridges only in segments 2–4, set low (at about 1/2 midbody height), thereafter evident lateral swellings; paraterga 2 with a small, but evident anterolateral indentation, following paraterga completely smooth at lateral margin. Lateral calluses of paraterga at most only very faintly delimited by a sulcus dorsally, more often totally wanting. Ozopores lateral, superficial. Tergal setae nearly fully abraded, a few short ones retained only on collum; setation pattern vague. Axial line wanting. Transverse sulcus on metaterga rather superficial, incomplete, far from reaching bases of paraterga, visible on metaterga 6–17, barely traceable on 5th and 18th. Stricture between pro- and metazona rather faintly striolate. Pleurosternal carinae small, complete in segments 2–4, a rounded caudal denticle retained also in segments 5–7, thereafter entirely missing. Epiproct (Fig. 49) short, flattened dorsoventrally, digitiform; apical papillae large, unciform, directed caudoventrally, tip distinctly emarginate; subapical papillae wanting. Hypoproct (Fig. 50) semi-circular, setigerous paramedian knobs at caudal margin well-separated and small. Sterna rather sparsely setose; a rather high, linguiform, roundly subtrapeziform, ventral, setose lamina only between coxae 4 (Fig. 51). Legs short, midbody ones ca 0.9–1.0 times as long as body height, apparently somewhat incrassate and longer compared to ♀; ♂tarsal brushes wanting. 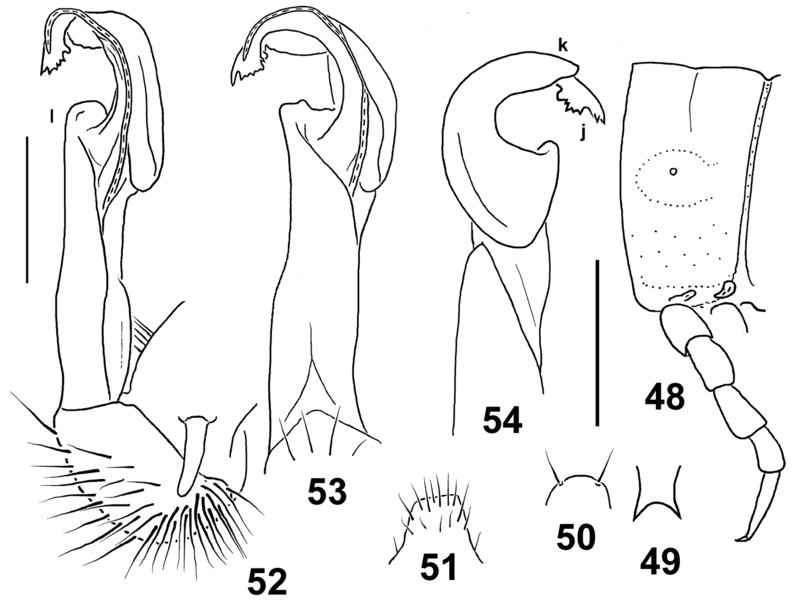 Gonopods as in Figs 52–54. Distal quarter of solenophore split into a small lateral lobe (k) and an abundantly denticulate larger branch (j). Femorite with a rather small apicolateral lobe (l). Eustrongylosoma pallidum sp. n., holotype. 48 segment 10, lateral view 49 tip of epiproct, dorsal view 50 hypoproct, ventral view 51 sternal lobe between coxae 4, caudal view 52–54 right gonopod, mesal, subventral and sublateral views, respectively. Scale bars: 1.0 (48–51) and 0.3 mm (52–54). Holotype♂(NMNHS), Papua New Guinea, West Sepik Province, Telefomin area, 1700 m, September 1975, B.S.E. (leg. P. Beron). – Paratype: 1 ♂ fragment(NMNHS), same locality, together with holotype. To reflect the beautiful appearance. Distinguished by the rugulose to rugose caudal halves of metaterga and the relatively thin paraterga (see also Key below). Length ca 20 mm (holotype), width of pro- and metazona 1.5 and 2.0 mm, respectively (both holo- and paratype). Coloration uniformly light yellow-brownish to brownish. In width, head >> collum = segment 3 = 4 < 2 < 5–16. Head densely setose, only vertex with 1+1 setae. Antennae rather short, slightly clavate, reaching midway of segment 3 dorsally; antennomere 2 longer than 6th. Collum transversely oval, lateral flaps small, regularly and broadly rounded. Tegument generally smooth and shining, only below paraterga faintly microgranulate; rear halves of metaterga rugulose to rugose longitudinally. Paraterga of postcollum segments relatively well developed (Figs 55, 56), narrow, only slightly thicker in pore-bearing segments than in poreless ones, set low (at about 1/2 midbody height), with a clear undulation in front of ozopore near caudal third to quarter; paraterga 2 with a small anterolateral indentation, following ones often with a minute indentation or puncture near midway. Caudal corners of postcollum paraterga mainly nearly pointed to pointed, beak-shaped, mostly not or only barely extending beyond rear tergal margin, evidently extending behind it only on segments 16–19. Lateral calluses of paraterga medium-sized, somewhat narrower in poreless segments, delimited by a sulcus dorsally, in pore-bearing segments ventrally in caudal 1/3–1/4 as well. Ozopores lateral, placed inside an ovoid groove. Tergal setae mostly abraded, medium-sized (ca 1/3 metatergal length), setation pattern traceable at least as 1+1 paramedian insertion points in front row. Axial line weak, traceable only on some metaterga, especially so in caudal halves. Transverse sulcus on metaterga rather superficial, incomplete, not reaching bases of paraterga, visible on metaterga 5–18. Stricture between pro- and metazona evidently beaded. Pleurosternal carinae small, well visible only in segment 2, reduced in 3rd, thereafter entirely missing. Epiproct (Fig. 57) short, flattened dorsoventrally, digitiform; apical papillae small, tip narrowly subtruncate; subapical papillae very small, removed from tip. Hypoproct (Fig. 58) semi-circular, setigerous paramedian knobs at caudal margin well-separated and very small. Sterna rather sparsely setose; a rather high, linguiform, roundly subtruncate, ventral, setose lamina only between coxae 4 (Fig. 59). 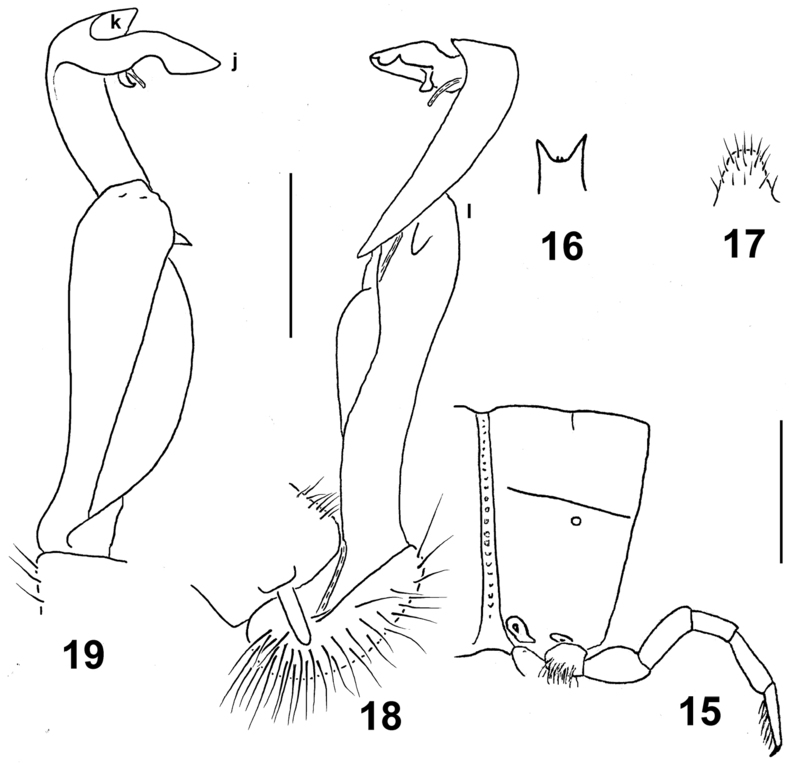 Legs long, midbody ones ca 1.9–2.0 times longer than body height, apparently somewhat incrassate and longer compared to ♀; ♂evident tarsal and distotibial brushes increasingly well reduced towards legs of segment 19. Gonopods as in Figs 60 & 61. Distal third of solenophore split into a lateral lobe (k) and a large branch/lobe (j) of irregular shape. Apicolateral lobe (l) of femorite rounded, rather low. Eustrongylosoma mirabile sp. n., holotype. 55 segment 10, lateral view 56 left half of segment 10, dorsal view 57 tip of epiproct, dorsal view 58 hypoproct, ventral view 59 sternal lobe between coxae 4, caudal view 60 & 61 right gonopod, mesal and sublateral views, respectively. Scale bars: 1.0 (55–59) and 0.5 mm (60 & 61). 2 Hypoproct semi-circular. Sternal lobe between ♂ coxae 4 stouter, truncate at tip (Fig. 3). 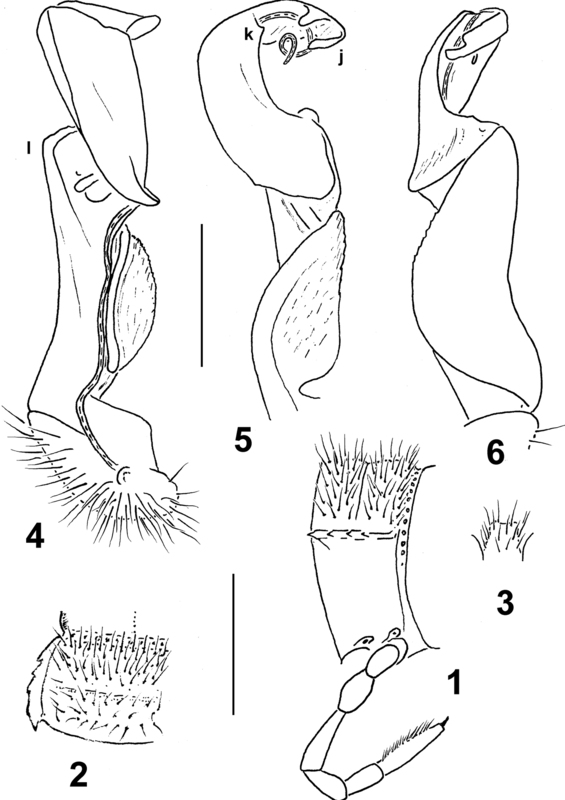 Gonopod tip more elaborate (Figs 4–6) Eustrongylosoma papua sp. n.
9 Gonopod tip not fringed (j, Figs 18, 19) Eustrongylosoma maculatum sp. 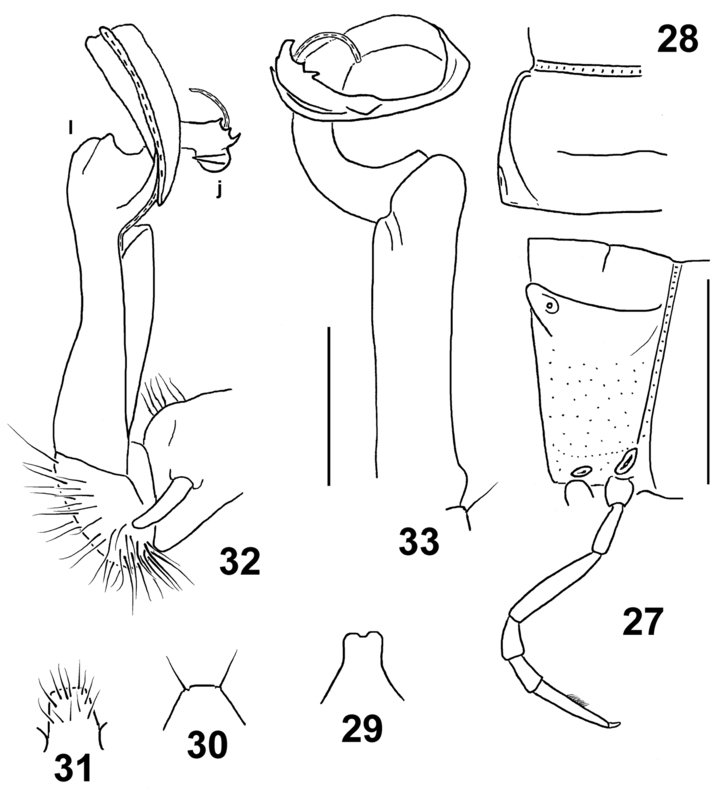 n.
– Gonopod tip evidently barbed (j, Figs 52–54) Eustrongylosoma pallidum sp. n.
– Coloration rather uniformly light brown to red-brown, devoid of a pattern Eustrongylosoma curtipes sp. n.
16 Body width 2.6 mm (♂). Coloration castaneous brown with a broad, rather vague, light yellow-brown, axial stripe. Distal part of solenophore deeply biramous (Figs 39, 40) Eustrongylosoma tifalmin sp. n.
18 Coloration uniformly light yellowish, but distal antenno- and podomeres contrasting dark brown. Caudal corner of all postcollum paraterga never extending behind rear tergal margin (Figs 41, 42). 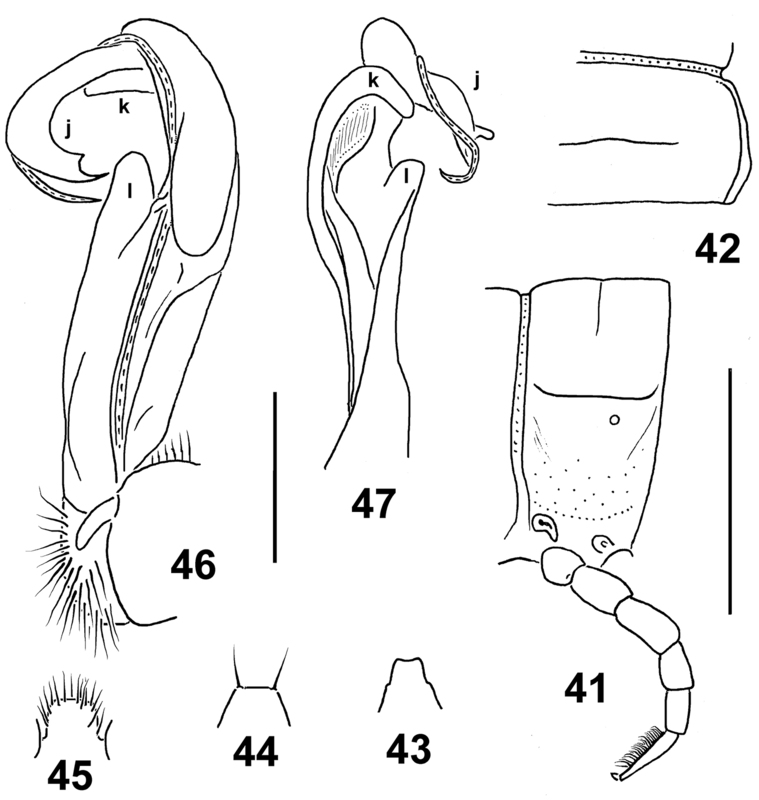 Gonopod as in Figs 46 and 47 Eustrongylosoma liklik sp. n.
20 Caudal halves of metaterga rugulose to rugose longitudinally (Figs 55, 56). Even pore-bearing paraterga thin in lateral view, caudal corners evidently extending beyond rear tergal margin only in segments 16–19. Gonopods as in Figs 60 and 61. Eustrongylosoma mirabile sp. n.
21 Paratergal calluses rather wide, very evidently delimited not only dorsally, but ventrally as well (Figs 7, 8). Pleurosternal carinae traceable as a caudal tooth until ♂ segment 10. Gonopods as in Figs 11–14, solenophore tip dentate/lobulate, not split. Eustrongylosoma tumbuna sp. n.
– Paratergal calluses rather narrow, only poorly delimited ventrally (Figs 27, 28). Pleurosternal carinae traceable as a caudal tooth until ♂ segment 7. Gonopods as in Figs 32 and 33, distal part of solenophore deeply split Eustrongylosoma masalai sp. n.
There can be no doubt that New Guinea supports numerous species of Eustrongylosoma still to be found and described. This is very easy to deduce from the huge size of the island, most of it as yet remaining nearly or completely unexplored concerning its millipede fauna, with only very few relatively thoroughly collected localities. The small regions of Telefomin and Finim Tel in western Papua New Guinea alone harbour as many as six and seven described Eustrongylosoma species, respectively. Some of the species seem to be not only sympatric, but even syntopic. Similarly, five congeners have been taken at Doormanpad, Indonesia (Fig. 62). Even though the number of Eustrongylosoma species seems to be the greatest in New Guinea, one must not forget that five species have also been described from the Solomon Islands, Melanesia (Chamberlin 1920; Jeekel 1973), one more, Eustrongylosoma kuekenthali (Attems, 1897), has long been found in Borneo and Sulawesi (Attems 1897; Golovatch 1997), and several still undescribed species occur on the island of Mindanao, Philippines, on the Caroline island Ponape, Micronesia (Hoffman 1977/1978), on the Biak Island, Indonesia (Golovatch 1997), as well as in the Vanuatu Archipelago, Melanesia (Deharveng in litt.). So at this stage any speculations on the hotspots of Eustrongylosoma diversity are far too premature. Distribution of Eustrongylosoma species in New Guinea, arranged more or less from west to east: 1 Eustrongylosoma bifasciatum 2 Eustrongylosoma castaneum 3 Eustrongylosoma cladis, Eustrongylosoma obesum, Eustrongylosoma prodelum, Eustrongylosoma typonotum, Eustrongylosoma zygethus 4 Eustrongylosoma tumbuna sp. n. 5 Eustrongylosoma beroni, Eustrongylosoma curtipes sp. n., Eustrongylosoma exiguum, Eustrongylosoma finimtel, Eustrongylosoma masalai sp. n., Eustrongylosoma papua sp. n., Eustrongylosoma tifalmin sp. n. 6 Eustrongylosoma liklik sp. n., Eustrongylosoma maculatum sp. n., Eustrongylosoma mirabile sp. n., Eustrongylosoma pallidum sp. n., Eustrongylosoma papua sp. n., Eustrongylosoma tumbuna sp. n. 7 Eustrongylosoma beroni 8 Eustrongylosoma versicolor 9 Eustrongylosoma oenologum, Eustrongylosoma fasciatum 10 Eustrongylosoma longesignatum. We are most grateful to the Bulgarian-Russian Interacademician Exchange Programme which allowed the authors for brief research exchanges in 2009–2011 to be made. Petar Beron (NMNHS) kindly provided certain important information concerning his 1975 trip to Papua New Guinea. Louis Deharveng (Paris, France) helpfully advised us on the presence of some closer unidentified Eustrongylosoma species in Vanuatu. Attems C (1897) Myriopoden. Abhandlungen der Senckenbergischen Naturforschenden Gesellschaft 23: 475-536. Attems C (1932) Myriopoden. In: Van Straelen V (Ed). Résultats Scientifiques du Voyage aux Indes Orientales Néerlandaises de LL. AA. RR. le Prince et la Princesse Léopold de Belgique. Mémoires du Musée Royal d’Histoire Naturelle de Belgique (Hors Série) 3(12): 1-34. Chamberlin RV (1920) The Myriopoda of the Australian Region. Bulletin of the Museum of Comparative Zoology, Harvard College 64: 1-269. Chamberlin RV (1945) On some diplopods from the Indo-Australian Archipelago. American Museum Novitates 1282: 1-43. Golovatch SI, Korsós Z (1992) Diplopoda collected by the Soviet Zoological Expedition to the Seychelles Islands in 1984. Acta Zoologica Academiae Scientiarum Hungaricae 38(1–2): 1-31. Golovatch SI, Stoev P (2009) New or poorly-known millipedes (Diplopoda) from Papua New Guinea, 1. Arthropoda Selecta 18(3–4): 125-130. Golovatch SI, Stoev P (2010) New or poorly-known millipedes (Diplopoda) from Papua New Guinea, 3. Arthropoda Selecta 19 (3): 145-152. Helgen KM, Leary T, Doria G, Amori G (2008) Catalogue of Melanesian rodents in the Museum of Genova (Mammalia: Rodentia). Annali del Museo Civico di Storia Naturale G. Doria 99: 653-686. Hoffman RL (1977/1978) Diplopoda from Papuan caves (Zoological Results of the British Speleological Expedition to Papua New Guinea, 1975, 4). International Journal of Speleology 9: 281-307. Holthuis LB (1974) Notes on the localities, habitats, biology, colour and vernacular names of New Guinea freshwater crabs (Crustacea, Decapoda, Sundathelpusidae). Zoologische Verhandelingen 13: 3-47. Jeekel CAW (1967) A revision of the Papuan Paradoxosomatidae (Diplopoda, Polydesmida) in the Museo Civico di Storia Naturale at Genoa. Tijdschrift voor Entomologie 110 (11): 343-379. Jeekel CAW (1973) On the status of the diplopod genus Mimosoma Chamberlin, 1920 (Polydesmida, Paradoxosomatidae). Bulletin Zoologisch Museum Universiteit van Amsterdam 3 (6): 31-37. Jeekel CAW (2009) Records of Paradoxosomatidae from New Guinea (Diplopoda, Polydesmida). Myriapod Memoranda 11: 75-82. Silvestri F (1895) Chilopodi e diplopodi della Papuasia. Annali del Museo Civico di Storia Naturale di Genova, Serie 2, 14(34): 441–450. Silvestri F (1896) I diplopodi. Parte I. - Sistematica. Annali del Museo Civico di Storia Naturale di Genova, Serie 2, 16(36): 121–254. Silvestri F (1898) Alcuni nuovi diplopodi della N. Guinea. Annali del Museo Civico di Storia Naturale di Genova, Serie 2, 19(39): 619–659.